I haven’t written about running since the marathon because, well, I haven’t been running. It’s been over seven weeks since Napa and I have literally run three times. Not on consecutive days, or even weeks. Not hard, fast, or long. All in all, I’ve been kind of a bum! And that’s putting it lightly! I knew I could take some time to relax and recover, but I really have no excuse for the last month of inactivity (and many lbs of cushy addition). I thought I’d head down the cycling road, and started to, then realized I really don’t enjoy doing hard workouts on the bike. I enjoy riding casually, even if it’s hard and hilly and takes all day, but I don’t want to go out and do threshold repeats. EVER. Running, I can push myself and still enjoy it. I can do tempo runs (ugh) and track workouts (less of an ugh) and feel good about it. Not so on the bike. After some serious deliberation, I decided: why do something I’m not enjoying? So, biking is now my fun/casual activity, running is my “I’m doing a focused workout” activity. After my first half-marathon last September, Derek and I both wanted to test the theory that signing up for a race would actually motivate me to train. I signed up for Napa pretty darn early (early October, I think? ), and we quickly learned that I was SUPER motivated with a goal to work towards! Finally! We had found my motivation! Too bad it left me in February… and has yet to return. Now, we’re putting this theory to the test again. After feeling successul in Napa, and like I could have probably run even faster, I’m in the mood to really push myself and see how much better I can get. 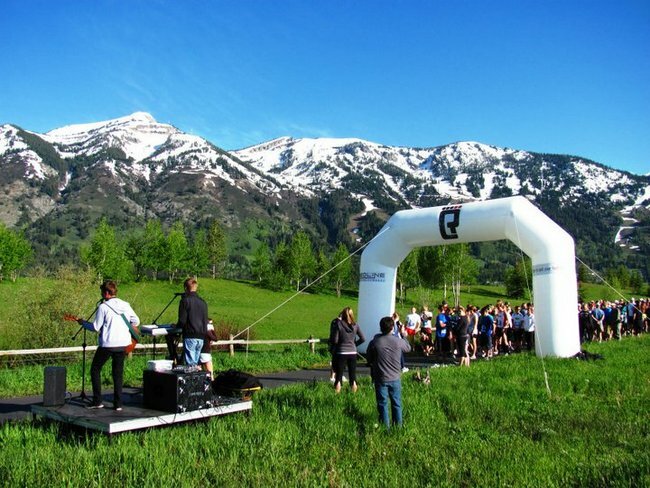 To get me on the right track, I signed up for the Jackson Hole Half Marathon, June 8, 2013. Wait… isn’t that in like, just over 6 weeks? Isn’t that not a lot of time to train? Right you are! I also happen to be lying incapacitated in my bed this week (hopefully not after today! ), so my training is yet to actually begin. Hmph. Being sick these last few days has made me realize I should run when I can — I really wanted to run yesterday! <-- for the first time IN MONTHS. I'm assuming that my fitness is still in there (um, me) somewhere, just a bit buried. These first few weeks may be hard, I anticipate they will be, but hopefully I'll spring back pretty easily and be able to do my paced workouts effectively. So, here's my 6-week training plan, with some explanations down below. EASY runs are going to start off around 8:45 pace, probably getting a little bit faster each week, not surpassing the 8:30 mark. TRACK workouts (e.g. 3×1600) are mile repeats to be done on the track (if it ever stops snowing). These times might be a little slow (assuming my fitness returns), but I’m giving myself a buffer just in case. TEMPO runs are going to be my biggest challenge. I don’t expect to hit my tempo pace in the first two weeks, but I do expect to make rapid improvement and get there quickly. Hopefully. LONG runs, honestly look like a walk in the park! After finishing many, many 18-milers, many more 16-milers, and a 20-miler, for marathon training, 14 miles or less sounds GREAT. Not to say they won’t still be hard these first few weeks, but I’m not too terribly worried. All things considered, this is not a very intensive plan. I know I’m rusty, and I’m giving myself the wiggle-room to ease back in. Not only does that make me psychologically more comfortable, it’s probably a good injury-prevention measure. In addition to running, I learned from marathon training that I need to cross-train. I need to be doing core work, especially, and plan to spend time on the bike for an alternative aerobic activity that will also help strengthen my legs. I may not be racing my bike, but I sure plan on riding it! Overall, I just needed a catalyst to get me moving again. Hopefully this will be it, and hopefully it will stick. I’m haven’t really set a goal for Jackson yet, as I’m not sure where my fitness level really is, but I think I should be able to break 1:40 at a minimum, if not 1:39! If I break 1:43 I’ve PRed, and I don’t think that’ll be a problem, despite the 3-mile climb at the end of the race. I’m tentatively planning on doing the Missoula Half in July, also, for which I’ll ramp up the training and try to break 1:37. I guess it’s time to plug in the ol’ Garmin again, and get you all ready for some nerdy running data! It’s gonna happen! On Wednesdays what does that mean tempo 7, 5? and when it says 6, 3X1600 are those miles done one at a time or consecutively? Tempo 7,5 means seven miles total, five of which (the middle 5) are run at the pace listed. “6, 3×1600” means six miles total (including warm up and cool down), three of those are are done separately at the pace listed. Usually I’d jog 800 between each mile. Does that answer your question?